Pre-heat oven to 19O C/375 F /Gas Mark 5. Mix 1 tbsp oil, balsamic vinegar, lemon juice and half the parsley. 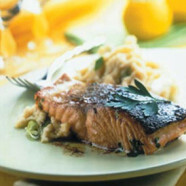 Place the salmon, skin side up, in a shallow oven proof dish, season and pour over the marinade. Allow to marinade for at least 10 minutes. Cook the salmon in oven for 8 – 10 minutes. The salmon is cooked when the flesh becomes opaque or when it flakes easily with a fork. Combine mash with remaining oil, parsley and spring onions.